Syracuse coaches cheer from the sideline. Mandatory Photo Credit: Kicia Sears, The Juice Online. Syracuse begins its 2019 NCAA Tournament against Baylor on Thursday at 9:57 p.m. (TV: TruTV). Ahead of the game, The Juice Online’s Wes Cheng and Saugat Sen give their predictions below. SAUGAT SEN (Season Record 2-3): Baylor finished fourth in a deep Big 12 Conference and come in limping into the NCAA tournament after losing four straight games. The Bears, however, possess some characteristics that may prove to be effective against SU’s 2-3 zone. Baylor finished third in the Big 12 in team rebounds, led by their star sophomore Mark Vital, who finished as the fourth best rebounder in the conference. Surprisingly, the Bears are not a very tall team, with their starting line-up Makai Mason (6’1″), Jared Butler (6’3″), Vital (6’5″), Mario Kegler (6’7″) and Freddie Gillespie (6’8″). The Orange will have a serious height advantage with Elijah Hughes (6’6″), Oshae Brissett (6’8″) and Paschal Chukwu (7’2″). The one statistic working in the favor of the Orange is that the Bears struggle to shoot from the outside, coming into this game shooting 34 percent from 3, 200th best in the nation. Only thing worse than the outside shooting is the Bears’ free throw shooting. After the three guards (Devonte Bandoo, Mason and Butler), the rest of the team is below 66 percent from the line. Chukwu will be critical in this game for the Orange. If he can stay out of foul trouble and dominate the glass, Baylor will likely struggle with second chance points. With Frank Howard being suspended indefinitely for a violation of athletic department policy, Buddy Boeheim will need to be shooting well for the Orange to open lanes for Tyus Battle and Elijah Hughes to drive through. For Baylor, Bandoo off the bench is a difference maker. While he can be streaky, he is by far the best outside shooter, at more than 40 percent from 3. At the end of the day, the zone will force Baylor to score from beyond the arc, and that will likely make the difference in this game, resulting in a 76-68 win for Syracuse. WES CHENG (Season Record: 11-6): There’s going to be a lot of talk about how Syracuse v. Baylor will be a battle of the zones, but make no mistake about it: Syracuse does their zone better. The Orange finished 24th in defensive efficiency according to KenPom, allowing an adjusted 93.9 points per 100 possessions. Meanwhile, Baylor was rated at a more pedestrian 98.2, which was 75th in the nation. The Bears defense is more about dictating tempo than turnovers and they lost their best interior defense, Tristan Clark, in January. Syracuse generates 8.27 steals per game while Baylor is more than two steals behind at 6.13 spg. Then again, this isn’t the Orange zone that played throughout the season now that SU has lost guard Frank Howard indefinitely. While Buddy Boeheim, who will likely start in his place, is a better outside shooter, the Orange is going miss Howard’s length at the top of the zone and the 1.5 steals per game he generated. Syracuse learned to live without its best player in the ACC Tournament, with Tyus Battle missing two games with a bruised hip. I think the Orange can make a similar adjustment with Howard, who never looked fully healthy after returning from an injury earlier in the year. 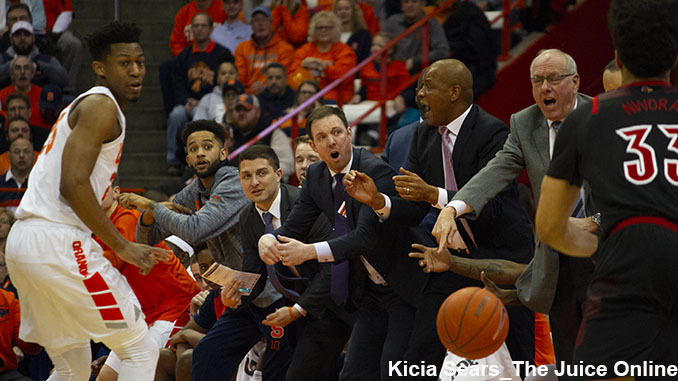 In Howard’s absence, Battle will take over primary ball handling responsibilities, and with Boeheim spacing the floor and a jolt off the bench from a rejuvenated Jalen Carey, I see Syracuse grinding out a 68-64 win to move on to the second round.